A good Samaritan found a small dog wandering the streets on May 16, in terrible shape. The good Samaritan brought the dog, later named Lucky, to the Humane Society of Macomb. The male Papillion, estimated at 5 years old, had severely raw and bleeding skin, as well as extensive hair loss. Testing of the skin determined Lucky had Demodectic Mange, which is a skin condition caused by the Demodex mite. Demodex is a cigar-shaped mite that exists normally in every dog’s hair follicles, and is normally kept under control by the dog’s immune system. When the dog’s immune system is challenged, the mites can increase in population. As this occurs, the dog becomes extremely itchy from the mites burrowing into the skin. The itch causes the dog to scratch, irritating the skin. As the mites increase in population, the itching becomes more severe, causing the dog to scratch continuously, ultimately leading to extensive damage to the skin. Open sores develop and the skin begins to bleed. Commonly, the damage to the skin can lead to a bacterial skin infection. Click here to view before photos of Lucky, but beware they can be upsetting. Demodectic mange is not contagious, but needs to be treated immediately, before further damage to the skin occurs. Treatment at the Humane Society of Macomb consists of administration of a drug called Ivermectin, which kills the mites on the skin. Figuring out what caused the compromise to the immune system is also important in determining how to best treat the dog’s infestation. In Lucky’s case, blood-work was normal. It is possible the stress of being lost contributed to his mange. Lucky began treatment with Ivermectin soon after he arrived at the Humane Society, and routine tests of the skin monitor Demodex levels. When the test for mites is negative, he will go up for adoption. Lucky will need to continue Ivermectin and regular testing for several months after he is adopted, to ensure the mange does not return. His hair may or may not grow back completely, but his personality makes him absolutely adorable. 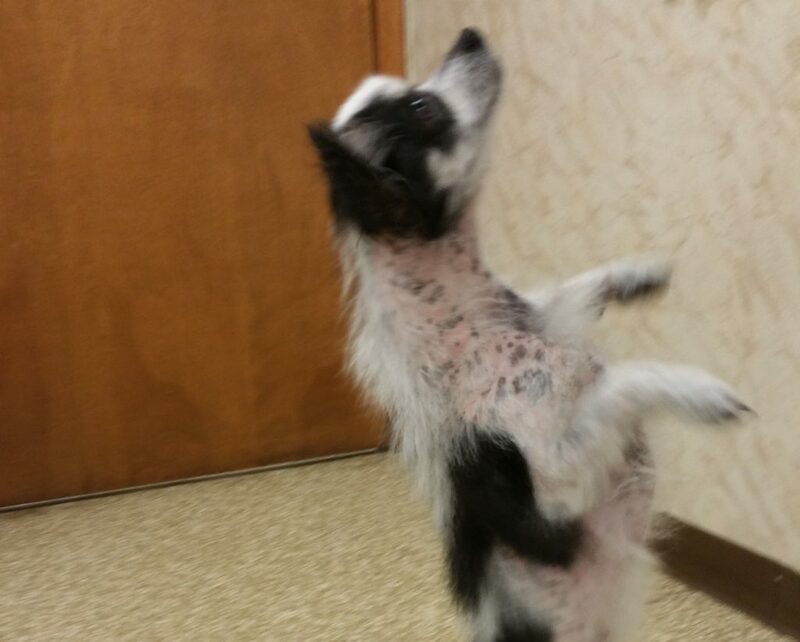 Lucky loves to dance, and will stand on his hind legs in anticipation of a treat. He loves to play-bow, wrestle with stuffed animals, and run alongside a friend. Lucky has nestled into the heart of every staff member, and will make a great addition to the family that adopts him. Watch the Humane Society of Macomb web site and Facebook page for the announcement that he is available for adoption! UPDATE: Everyone loves a happy ending. Lucky went up for adoption on August 11, 2016 and found his furever home on August 19, 2016. We will miss him.